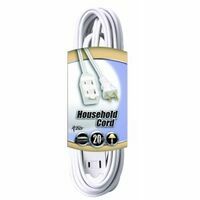 CCI Extension Cord, Household Cube Tap, 16/2 AWG Conductor, 20 ft Length, 13 A, 125 VAC, PVC Jacket, White Jacket, cUL Listed, For Clocks, Lamps and Holiday Lighting Manufactured with stranded and cabled copper conductors and solid molded plugs for longer life. Outer jacket wont mark floors or walls. 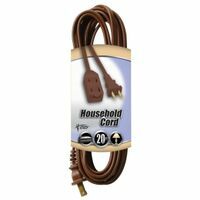 SJTW cords resist deterioration from moisture and abrasion. 300 volt wire rating. Sleeved. For air conditioners. Features heavy-duty vinyl insulation and right angle plugs. 15 amp/125 volt. UL, cULus Listed. Sleeved.